Out here on the Island, we love our craft beer. Victoria is no exception! It even plays host to its own Victoria Beer “Week” – a 9-day event (because a drinking week has 2 extra days) that supports and shows off BC craft beer and local artisan food. The event’s goal is to educate and satisfy visiting and local beer enthusiasts alike! If you’re a beer lover, take the time to try some of British Columbia’s finest beers from Victoria’s handful of micro-brewpubs and well-known breweries. The brewpubs also have many tasty eats and other drinks available to please the palette if beer isn’t to your liking (don’t worry, we’re not judging…). Victoria is home to some top-notch breweries, and a couple of them sit in a row right downtown! This comes in handy for beer connoisseurs who want to sip their way into the heart of Victoria’s beer culture. Book a brewery tour through a company to experience door-to-door service with snacks on board. All you’ll need to do is kick back and enjoy your beers without worrying about who’s DD. There’s even a brewery hop-on, hop-off bus in the summers! A couple of Victoria’s breweries are top secret inside and do not offer tours, but for the most part, you’ll be invited into the tasting room. If you don’t want to book a tour, just pop by your favourite breweries to see when tours start. If you’ve missed the tour, you’ll likely be able head into the tasting room and just skip straight to the beer tasting, too. Even if it isn’t branded as a full-on brewery, many of Victoria’s pubs offer their own crafted beers. There’s no shortage of places to grab a great pint! Some restaurants even boast more than fifty different taps. Victoria takes the title of Beer Capital of British Columbia very seriously, so expect a number of the local bars to not only have Victoria’s favourite local beers on tap, but craft brews from the rest of the country, continent and top beers from other parts of the world. Good food to match is just a perk of grabbing a pint at a brew pub. 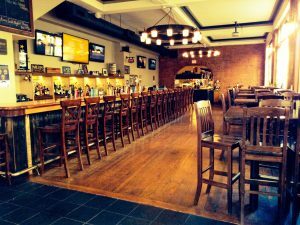 First opened in 1867, the Garrick’s Head Pub is home to Vancouver Island’s largest selection of draught beer, with 55 taps featuring craft beer from Victoria and the rest of B.C, as well as from all over the Pacific Northwest and around the world. Traditional pub fare along with some west coast offerings, as well as a wood-burning fireplace and a patio overlooking beautiful Bastion Square will keep you here for a while! Take in some history as the pub was a welcome sight for those in old Fort Victoria, and the spot for one final drink for those condemned to be hanged by the old courthouse across the square. It’s also one of the oldest English pubs in Canada, and the elk head coat of arms above the fireplace has seen as many years as the pub itself. The Churchill offers a wide variety of original, fresh-ingredient cocktails, as well as 70+ whiskeys for you to enjoy along with tapas, appetizers, burgers and entrees right on Government St. in the heart of downtown Victoria. Second only to the Garrick’s Head Pub next door in the amount draught selection on Vancouver Island, The Churchill has 50 taps including a diverse mix of unique craft beer as well as imports and cider. 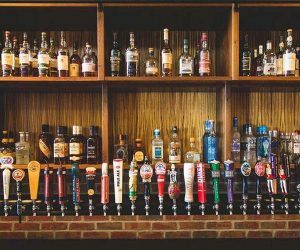 It’s a go-to for local beer and whiskey lovers, and is the perfect place to share a cozy atmosphere with a friend, or a few.